This is the controller for the GR-300 analog Synthesizer. Low wattage pickups are on this one for sweet subtle playing. Used on assorted sections of ‘Party Favors’ and ‘Latenight’. Another pawn shop prize. While not owning a true jazz guitar at present, I can put flat wound strings on this one and get into that ballpark, minus the hollow body sound. The neck and body were bought separately. I experimented with filing the neck, further contouring the body and gave it a clear satin finish. It worked out nicely! Equipped with a Roland GK-2A Synth Pickup. My main ‘synth’ guitar for decades of live solo gigs and studio tracking. Sporting many wounds and battle scars, it’s still holding together. I tracked nearly all the synth and keyboard parts on ‘Dreams To Reality’ with this one. The older GR-1 guitar synth was used as the A/D converter to drive the synth modules and keyboard as I discovered it has a lower output than the newer models, allowing more subtle touch dynamics, control and playability. The original yellow finish was removed and replaced with a natural mahogany stain. The pickups were also replaced with Seymour Duncan Hot Rails. Concerned that my main synth guitar (above) might not hold up much longer, this was a surprise pawn shop find that allowed me to have an exact model copy of my main synth guitar. My main, #1 go to guitar for covering all bases. 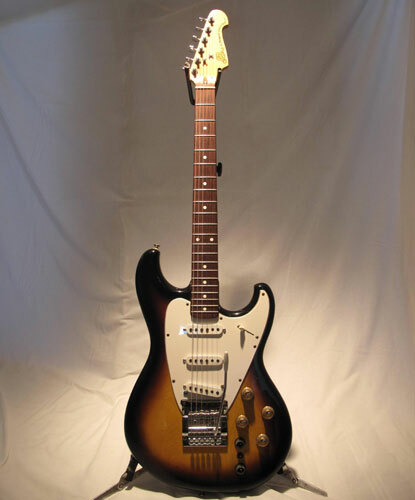 The Pacificas were designed by Rich Lasner for Yamaha and were a precursor to the guitars he would later design for Ibanez. A heavier Floyd Rose tremolo was added for more sustain and I gave the neck a custom filing. Super comfortable to play. Dimarzio humbuckers are in the neck and bridge with coil tapping. An HS2 resides in the middle for clean funky rhythm parts. The bridge humbucker can deliver Texas grind to country twang while the neck humbucker serves up a nice warm, fat, jazz tone or single-coil sweetness with coil tapping. I found this one in a salvage store ‘fire sale’ and since then have acquired two more as backups. Thanks to Tony Martinez for the creative wiring on all three. Used throughout the ‘Dreams To Reality’ project. I saved up for a year to buy a $2600.00 Sadowsky Electric Nylon string only to be hit at tax time owing, yep, you guessed it… $2600.00. So instead, I ordered this nifty Les Paul shaped Yamaha Electric Nylon String for $450.00. I sent it to Nashville luthier Joe Glaser who installed the ‘Buzz Feiten’ tuning system and also added a couple extra frets to the fretboard. I’ve been enjoying it ever since! Awesome guitar! A fantastic gift from my fantastic wife who knew I was searching for a designated slide guitar. Turns out, it sounds great on everything including slide. The combination of growl and top end bite of the ’57 Classic Alnico II pickups along with the super comfortable neck make it hard to put down. I began playing mid-afternoon the first day I got it home and the next thing I knew, the sun had gone down and I was still playing,…in the dark. A Christmas gift from my sweet wife. Made in Washington State, with solid cedar top, solid mahogany sides and back, rosewood fretboard and bridge, and unique sound hole. It’s tuned to ’A’ like a guitar capo-ed at the 5th fret. The Papoose has been a secret recording weapon for doubling and fattening up guitar parts with its rich high-end harmonics, mandolin-type sounds and distinctive chiming tone. A cool little travel guitar. I can practice in the passenger seat while my wife drives the car and I won’t poke her in the ear with the headstock! She appreciates that. A unique little instrument with gorgeous woodworking, especially the deep bowl on the back. It was just too cool to pass up.